Heat in the canning process also reduces the amount of vitamin C that is present and plentiful in fresh pineapple. (Compare 28 percent daily value in canned vs 60 percent daily value in fresh.) In addition to containing a high amount of vitamin C and manganese, fresh pineapple also delivers vitamin B and thiamine. Vitamin B is shown to assist with energy levels, metabolizing food into useable energy. Pineapple has a plethora of health benefits, including lowing risk of heart attack, supporting bone strength, boosting the immune system and reducing macular degeneration (a disease that affect eye health as we age). When a recipe calls for fresh pineapple, head to your local supermarket and choose a fresh pineapple. Keep in mind that ripe and ready to eat pineapples from Costa Rica and Central America may be green – this is natural and normal to find throughout the year! 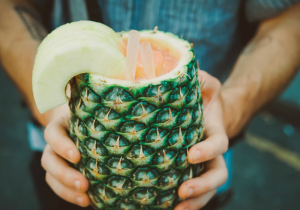 To make fresh pineapple juice for recipes, check out a great easy way to prep your own rather than reaching for unhealthy canned alternatives via the recipe below. Add fresh pineapple pieces into a blender with water and sugar. Blend until smooth. Strain the juice to remove pulp using a juice strainer. (A regular strainer works fine as long as the mesh is small.) Add more water if necessary. Serve over ice with fresh mint leaves and a pineapple wedge. Enjoy the benefits! Original recipe adapted from Whisk Affair. This entry was posted in Latest News, Recipes, Tips & Tall Tales and tagged bromelain, fresh pineapple, pineapple, pineapple health, pineapple juice. Bookmark the permalink.